Everything was perfect. The location is great, the apartment is very clean, a lot of free parking. Eva's hospitality is incredible, she helped me a lot. Great value for money. Highly recommended. Mrs. Eva Klini is a perfect host!!! More of that she became our friend. Very friendly, accurate, caretaking person. Communication with her is very easy. The appartment which was so big (bedroom, living room with kitchenette, balcony) was cept clean by her every single day. Eva gave us great advices and recommendations about our holiday in Crete (where to go, what to see and visit, rent a car company, etc.). The property is very close to Amoudara sandy beach, bus stop is in front and opposite of the street, a couple of supermarkets. Public transport is very regular and convenient for visiting Heraklion. The last bus to Amoudara is about 23 p.m. Highly recommend! Eva, you made our stay so special! Thank so much!!! Everything was just perfect. The apartment was very clean and lovely, it is close to the beach, bus station and market. Eva is very helpful and nice. I recommend the place to anyone who wants to spend a relaxing holiday in Heraklion. The owner was very communicative and open to our requests. We had useful utensils in the kitchen and the beds were confortable. They changed the towels daily and did the cleaning daily. Spacious & clean apartment with kitchenette, shower, air con & access to pool. 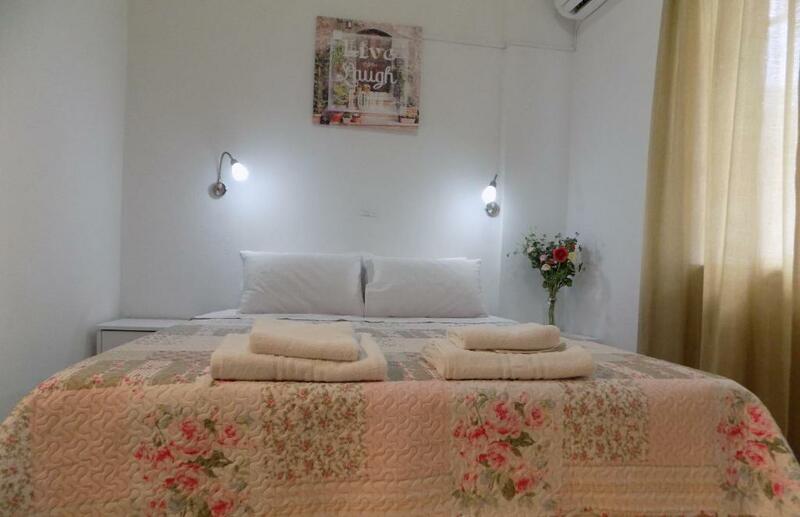 The comfortable, clean and well equipped apartments in combination with the amazing hospitality of Mrs Eva satisfied even the most explicit of a group of 14 people that stayed in Eva's apartments. We were a multinational group of people from the UK, US, Greece, Spain, Italy, Poland, Czech Republic and Turkey) that stayed in Crete for 3 weeks as part of a summer school. 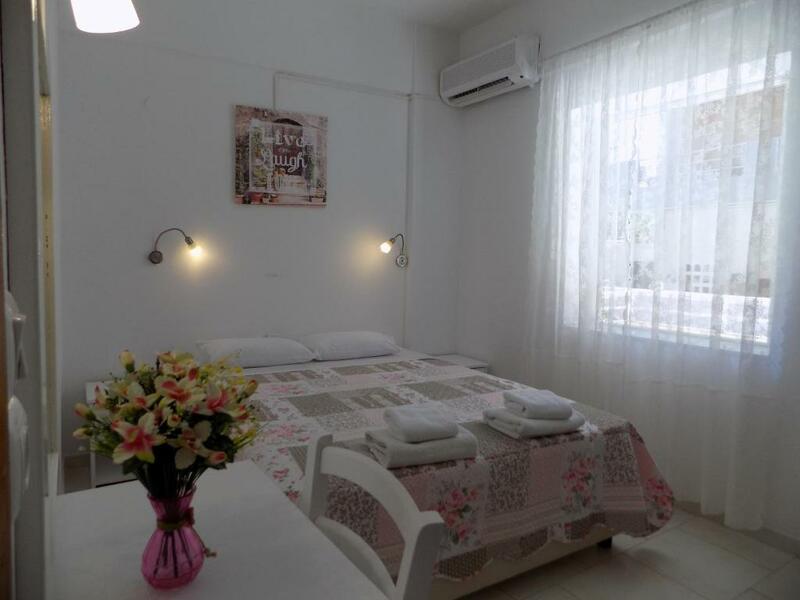 The accomodation at Eva's made our trip especially pleasant as it combined a quiet and pleasant enviroment in the heart of the summer resort of Ammoudara with access to the pool and beach and also easy access to Heraklion city center! We are very keen to return for next year!!!!! A big 10 from us! De sleutelkluis werkt perfect, je kan aankomen wanneer je wilt en meteen je kamer in. Bus naar de stad en het vliegveld stopt pal voor de deur. In het restaurant aan de overkant kun je heerlijk eten. Heraklion met de bus prima te bereizen, er valt daar veel te zien. Lock in a great price for Eva apartments – rated 8.8 by recent guests! Eva Apartments are located in the seaside resort of Amoudara, only 1.9 mi from Heraklion. Accommodations consists of air-conditioned apartments with free Wi-Fi and a fully equipped kitchen. Free public parking is provided right next to the property. Each of the apartments has 2 separate rooms. The bathroom includes a tub, while the kitchen comes with a mini oven, fridge, utensils and dining table. Their private balconies offer views over the pool, garden or surrounding streets. Eva Apartments also houses a seasonal restaurant and snack bar. The restaurant serves breakfast, lunch and dinner in buffet style. A seasonal pool and BBQ facilities are also featured. Eva Apartments are less than 3.7 mi from Heraklion Port. The city’s airport is at 6.8 mi. During the summer season, reception may assist you with tours or car rental on a 24-hours-a-day basis. When would you like to stay at Eva apartments? Air-conditioned apartment with a separate bedroom. Facilities include a bathroom with tub, TV, kitchen with mini oven, fridge and dining table. Το "eva apartments", αποτελείται από 12 δίχωρα διαμερίσματα. Είναι φωτεινά,καθαρά, ευρύχωρα, κατάλληλα για οικογένειες. Φιλικό, φιλόξενο περιβάλλον.Στην αυλή μας θα δείτε την ηλιόλουστη χαλαρωτική πισίνα,snack bar, εστιατόριο στην οικογενειακή (είναι αδέρφια μου) επιχείρηση "hotel Roxani". Ακριβώς μπροστά είναι η στάση λεοφωρείου. Σύνδεση με το Ηράκλειο κάθε 10 λεπτά, σύνδεση με την αρχαία πόλη της Κνωσσού κάθε μία ώρα. Στην γειτονιά υπάρχουν super-mini markets, ταβέρνες, καφετέριες, παιδότοπος, παιδική χαρά,κινηματογράφος, ενοικιαζόμενα αυτοκίνητα,φαρμακείο, φωτογραφείο, souvenir shops,τρενάκι που κάνει διαδρομές πάνω στο βουνό και επίσκεψη σε μοναστήρι με μοναδική πανοραμική θέα στο πέλαγος. House Rules Eva apartments takes special requests – add in the next step! Please inform Eva apartments of your expected arrival time in advance. You can use the Special Requests box when booking, or contact the property directly using the contact details in your confirmation. the room was very clean and spatious, we had our sheets changed everyday, the beach is really close, Eva was really kind, she gave us a baby bed free of charge. Thank you Eva!